Come check us out at our NEW LOCATION! 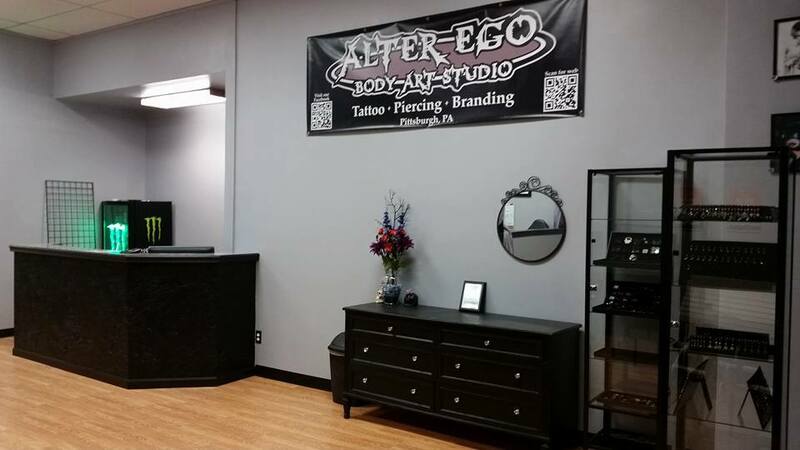 Alter Ego Body Art Studio specializes in tattoos, body piercing, and branding. Our South Hills design studio offers a safe and sterile environment that is comfortable and inviting. Alter Ego is the only studio in Pittsburgh that offers branding. We also do complex surface piercing. We can help you design a custom piercing to give you a unique look, and we offer the perfect jewelry pieces to accent it. Our experienced tattoo artists have a range of specialties. Be sure to check out their portfolios! We offer services to people ages 13 and up (at the discretion of the artist and with in-person parental consent for minors, as well as birth certificate). When you walk in to Alter Ego, we will get you working with the artist who specializes in the art you want. Your artist will work with you on all facets of the project to ensure that your vision comes to life, while staying within any boundaries such as size or budget. We also follow up with you after the procedure to ensure that you are satisfied. Please call or stop by, Tuesday through Saturday between noon and 7 p.m., and discover what makes us different. Acceptable forms of payment are Visa, Discover, MasterCard, and cash. Sorry, but we do not accept American Express or checks. If you are under 18, the following restrictions also apply. Your parent or guardian must be present. Your parent or guardian must show his or her own proper identification as described above. Your parent or guardian must show proof of your guardianship by presenting your birth certificate, guardianship papers, or adoption papers. What safety precautions do you follow? Our staff of body art professionals uses only high-quality products that are sterile and clean. Every member of our staff is trained and certified in bloodborne pathogens. We utilize single-use supplies which are properly disposed of after one and only one use, and the items that are not disposable are sterilized in our autoclave before every use. Our autoclave is tested monthly to ensure only sterile items are used on our valued customers.